A first pressing, with a black rainbow label without "subsidiary" rim text, "Words Of Love" credited to ASCAP. Back cover listing songs and the note: 'see label for correct playing order'. Released at the same time were back covers with correct playing order. This pressing is from Capitol's Scranton plant, identified in the matrix with an IAM triangle stamp. Original pressings came with olive colored Capitol inner sleeve. I can see from reading these comments that I am going to have to go back and do some more homework on the records I have already listed. 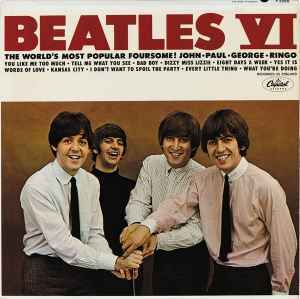 Meanwhile, I have a copy of Beatles VI that I am clueless on how to list. The catalog number is the same for '65, '68, '71 and '75. I bought the record in the late '80s. The guy who ran the record shop, and from whom I bought a ton of records, told me that he could get me original records from the '60s and '70s so I assumed that that is what I got when I bought all of these. How can I tell if my record is from 1965, 1968, 1971, or 1975? I have looked at the runout but that doesn't tell me much. It has the catalog number in there and tells me which side of the record I am looking at but what does the H27 on side one and the H24 on side two mean? These are numbers that are etched into the runout, not stamped. mine matches the first listed excpt has an orange sleeve "join the teen beat" and has different runout numbers. My release is very similar to this one, although mine is lacking the IAM stamp in the runout, and the runout on both sides is similar to the format that tolteke2007 posted below. I'm wondering if I should copy this and make a new release? None of the other Mono releases are as similar as this one is. I have a vinyl copy of this album that's slightly different from the ones listed here. The record lable is an apple; green whole apple on side 1, and white sliced in half apple on side 2. The thing that is different is that it says it is manufactured by Capital Records in small print at the bottom. Also, the jacket does not have the Gold Seal. Any idea when and where this was manufactured? i have a record with a catalog number of ST 2358, but the the label isn't orange capitol or apple, it's black capitol with a color ring. so where does that leave me as far as pressing/reissue goes? One of the weakest albums in the Beatles' catalog. This release has no english counterpart; it is your typical american Capitol Beatles' lp -- eleven songs patched together from other british albums. The highlights are "What You're Doing" and "Every Little Thing", two very pleasant pop tunes. A real surprise is "Kansas City / Hey Hey Hey" which is one of the Beatles' best rockers. As on "Long Tall Sally", McCartney challenges Little Richard's version of this song and wins by default. The Beatles wisely changed Holly's "Words of Love" very little. It's a nice tribute to Buddy. "Yes It Is" is a melancholy beauty, with tasteful use of guitar feedback. Except for the trademark guitar riff on "Eight Days a Week", the song is unremarkable, as is "I Don't Want to Spoil the Party". Add to the list of forgettable Beatles' songs "Tell Me What You See" and Harrison's awkward "You Like Me Too Much". Curiously, Lennon seems uninspired on the Larry Williams' songs "Bad Boy" and "Dizzy Miss Lizzie". Maybe because Lennon did such a spectacular cover of Williams' "Slow Down" previously, these two songs seem to pale before the originals. Truly, we can't blame the Beatles' for this collection. Capitol Records is the guilty party. And this compilation is easily the worst patchwork compilation of Beatles' tunes.